At Giannini Gray Dental Partners, it is our goal to educate, motivate, and promote regular preventive care so our patients can enjoy a lifetime of optimal health. We “inform before we perform” to ensure that patients are aware of all their options. Our office is comfortable, modern, and immaculately maintained. It was designed to offer a relaxing, soothing environment for patients and a pleasant workplace for our staff. A large, open waiting area greets patients and connects to our reception and business office area. For your comfort and convenience, all treatment rooms are private, with top-of-the-line reclining dental chaises. The safety of our patients and staff is of utmost importance at Giannini Gray Dental Partners. Our treatment rooms are designed with state-of-the-art equipment to meet or exceed the highest standards for patient safety. Our staff adheres strictly to all Occupational Safety and Health Administration (OSHA) standards. We offer many appointment times during the week, including early-morning hours. Our doctors are also available on call 24 hours a day to address your emergency needs. Appointments are carefully scheduled so patients and doctors alike are not rushed or kept waiting. We pride ourselves on seeing each patient on time. We ask our patients to help us maintain our schedules by being prompt for each visit. Our doctors have completed extensive continuing education at the LD Pankey Institute and are members in good standing with the American Dental Association and its local affiliates. In recognition of his career accomplishments and dedication to the profession, Dr. Giannini was inducted into both the prestigious American College of Dentists and the International College of Dentists. 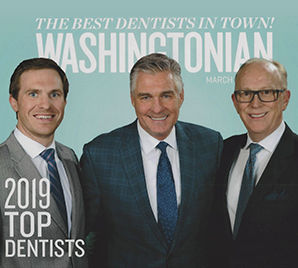 He was awarded the District of Columbia Dental Society’s highest honor, the Sterling V. Mead Award, in June 2018 for his service to the profession and the society. In July 2010, Dr. Gray was awarded the Academy of General Dentistry’s prestigious Lifelong Learning and Service Recognition, an honor bestowed upon only 115 dentists since its inception. He is also a valued consultant, the longest-tenured faculty member, and the number-one certification speaker for Align Technologies, the manufacturer of Invisalign® clear aligners. Prior to joining the practice of Giannini Gray Dental Partners, Dr. Schwartz served as a dentist in the practice of University Dental Associates, where he performed complex dental procedures in multiple specialty fields, such as fixed and removable prosthodontics, periodontal surgery, pediatric dentistry, root canal therapy, and oral surgery with surgical extractions.